When James Lukens McConaughy campaigned for Governor in 1946, he could already boast of an impressive resume: President of Wesleyan University in Middletown (1925-1943), Lieutenant Governor of Connecticut (1939-1941), President of the United China Relief (1942-1946), and a prominent role in the Office of Strategic Services (OSS) during World War II (1943-1945). The OSS was the predecessor of the Central Intelligence Agency (CIA). In late 1943 McConaughy was recruited by Major General William J. Donovan of the OSS to serve as Deputy Director in Charge of Schools and Training. The former college president oversaw a campus that was scattered all over the world. To ensure the necessary secrecy, McConaughy’s trips to Washington, DC, and abroad were supposedly made in connection with his work as President of the United China Relief (an aid organization dedicated to supporting Chinese civilians and military in their struggle against Japan). McConaughy touted his OSS experience during his 1946 campaign for governor, stating that it taught him how to work with all kinds of people. He courted veterans by reminding them that in the OSS he worked with them, trained them, lived with them, understood them, and got to know their desires, needs, and financial limitations. He sought the support of labor by explaining that it was American labor leaders who assisted the OSS in organizing foreign labor leaders into sabotage crews. Communism is a cancer which will destroy America if it is not driven out. The two greatest fighters against American Communism are the Church and the Republican party…We Republicans pledge to continue to keep our party free from this menace. Let the Communists of Connecticut vote the other ticket, not ours. McConaughy died in office on March 7, 1948, having served little more than one year of his term as governor. The James L. McConaughy Papers were donated to the Connecticut State Library in August 2008 by McConaughy’s grandson, also named James L. McConaughy. The papers complement McConaughy’s gubernatorial records and include not only speeches from McConaughy’s time as Governor and Lieutenant Governor but also photographs, correspondence to his wife written during his overseas trips for the OSS, and his scrapbook from Yale University, from which he graduated in 1909. © Connecticut State Library. All rights reserved. This article is excerpted and originally appeared in The Connector Vol. 11/No. 2, April 2009. “James L. McConaughy, Office of the President.” Wesleyan University, 2013. Link. McConaughy, James L. (James Lukens), and Elizabeth McConaughy. “Finding Aid to the James L. McConaughy Papers, RG 069:146.” Connecticut State Library, 2013. Link. 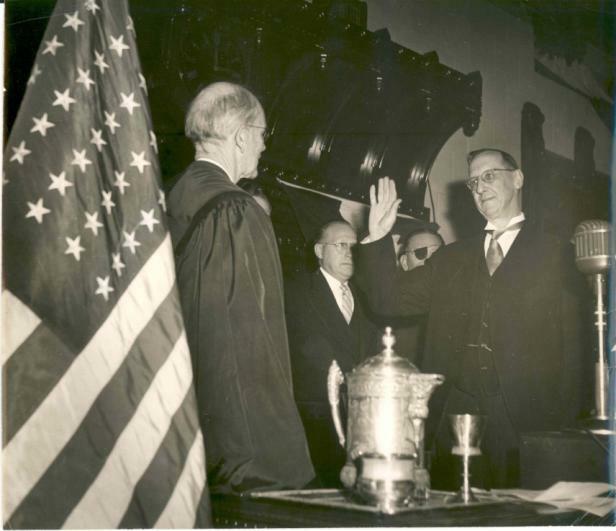 “Finding Aid to the Office of the Governor: James L. McConaughy and James C. Shannon (1947-1949) Inventory of Records, RG 005:030.” Connecticut State Library, 2013. Link.